Area Christians suspect government forces arrested them. 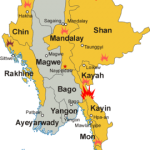 YANGON, Burma (Morning Star News) – Two assistant priests in Burma (also called Myanmar) are missing after informing journalists about the bombing of a Catholic church building in Shan state, sources said. Dom Dawng Nawng and La Jaw Gam Hseng went missing on Saturday evening (Dec. 24) after helping journalists cover the bombing of their church building earlier this month, local residents said. The two were last seen near a Burma Army military base called Byuha Gon (Strategic Hill) in Mong Ko town, in northern Shan state, they said. The clergymen assisted three reporters from Yangon-based news organizations, including the Democratic Voice of Burma (DVB), The Irrawaddy, and the Kumudra Journal, who traveled to war-torn Mong Ko where Burma forces reportedly bombed the Catholic church building on Nov. 23-24. The Kumudra Journal reported that local residents noticed the disappearance of the two leaders after they failed to show up for Christmas worship on Sunday (Dec. 25). The residents asked each other about the church leaders, who are residents of Mong Ko, and were unable to reach them when they called them. Local residents believe that the leaders might have been arrested by Burma Army troops, as they were seen near the Byuha Gon military base. Area religious leaders investigating their disappearance tried to access the military base and inquire about the two church leaders, but Burma Army troops forbade them from entering, local residents said. The religious leaders planned to inform local administration authorities if they don’t find the missing clergymen. Fighting between Burma armed force and ethnic armed organizations broke out in the area in November, forcing over 50,000 refugees to flee to northern Shan state and the China border area. In a practice that a recent U.S. government report described as “routine,” the Burma soldiers occupied the church building in Mong Ko, in the country’s northeast near the Kachin state border, in November, as they believed armed ethnic groups would not attack it. After the army retreated, a Burma armed forces jet reportedly bombed the church building on Nov. 23-24 in order to destroy weapons and ammunition the retreating soldiers had left. Mong Ko, where the Burma Army also reportedly burned homes and paddies, is occupied by predominantly Christian ethnic Kachin, as well as Chinese, Lisu, Palaung (Ta’ang) and Wa peoples. After more than five years of intensified conflict since Burma violated a 17-year cease-fire in 2011, many Kachin face protracted displacement and are desperate to return home, according to a report by the U.S. Commission on International Religious Freedom. The Burma Army reportedly retook control of Mong Ko in December and urged displaced residents to return home. Army officials have said they rebuilt the damaged Catholic church building for the residents, according to state-run newspaper The Global New Light of Myanmar. The newspaper also reported on Sunday (Dec. 25) that more than 10,000 displaced residents had returned home in Mong Ko as stability has been restored.